ears of research started out as a small project to document the Canova family tree for my son. Now it is an attempt to make it as complete and accurate as possible. The family tree within these pages spans over 15 generations and is as wide as the world with relatives everywhere. 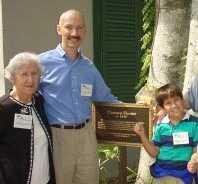 If you are a Canova living in the USA, there is a good chance you and your immediate family can be found here. But if you don't see yourself, please let me know! Look through the Family Tree. Of the 1798 family members and 15 generations recorded here, there are now over 178 photographs from family members like you. New visitor? Click here to get started, but please let me know if you see additions or changes. I'm always looking for improvements. Know of a birth or death? Please send a note to seaware@yahoo.com to contribute. No fact is too small to add, and references about your sources are appreciated. Have Family Photographs?These are the things that show life both past and present. Now, photographs have been added to this family tree to bring it to life. Check your drawers! Send or email pictures of yourself or others to help record our visual history. Taken October, 2000 at the Canova Connection's family reunion in St. Augustine, FL Canova house. Left to right: Antonica, Frank (me! ), and Cameron in front of the historic Canova house. As I Remember The Canova family is very fortunate to have the writings of Philip J. Canova, Jr to help us remember our past. With permission of my cousin Betty, I'm pleased to be able to share our Uncle Phil's book "As I Remember" with you. It has many stories about his life and of our family's history, including kindness to slaves and seeking one's dreams. Please charish this, learn from it and pass it on to future generations.